The best new audio gear is produced by small, independent companies that develop innovative approaches to the sonic experience. 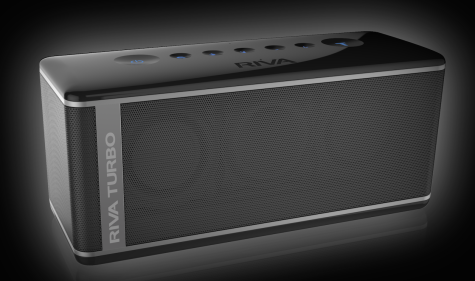 RIVA Turbo X Premium Portable Bluetooth Speaker is the size of a small loaf of bread, but weighs a lot more and sounds great. Its rectangular edges are rounded and contoured, with magnificent attention to detail in the physical product. Design is stellar, and functionality is effortless. The unit is available in either all black or all white. Follow the detailed written instructions to AC charge the speaker and pair (or connect) it with an audio source via Bluetooth; or play through an included AUX cable. Turbo X is battery powered; it goes anywhere and everywhere, but don’t leave it outdoors in lousy weather. A helpful USB charging port enables you to maintain charge an attached iPhone, iPad, iPod, or other similar device as needed. A red ON/OFF button on the rear assists to minimize battery drain during dormant periods. Very clear speakerphone capability is built in for use with Bluetooth devices for hands free phone, FaceTime, and Skype calls. Operational buttons are cleverly flush mounted in smooth, recessed circular depressions on the top deck. A female voice alerts the user when Turbo is in pairing mode and Turbo is paired, meaning when the speaker is switched on and then Bluetooth connected. The blue LEDs on this top deck illuminate automatically when your hand is placed near the unit. This is a sweet feature! If you press the plus sign for full volume on Turbo X, you can control audio levels from your iDevice. There are no EQ or treble/bass controls on the speaker. It reproduces Bluetooth and AUX audio with accuracy and fidelity, using the latest technology to the max. The S button activates surround sound, and the T button blasts off turbo mode volume boost, either or both in addition to the default soundscape. The printed manual suggests appropriate listening situations and environments for each of these three profiles. A free dedicated iOS app assists with these settings plus battery monitoring. Turbo X is very loud at full volume, without any distortion. At moderate volume, this speaker is great for personal listening. At top level, you will rock the socks off your party guests, especially in turbo mode, and your neighbors will soon be pounding on your door. They will want either to join the fun or have you arrested. This speaker exhibits enough precision to enable the careful listener to hear the difference between low, middle, and high-bitrate recordings. It approaches audiophile quality, when that is important, and the neutral representation of the audio spectrum only slightly emphasizes the midrange, with excellent bass and crisp treble. 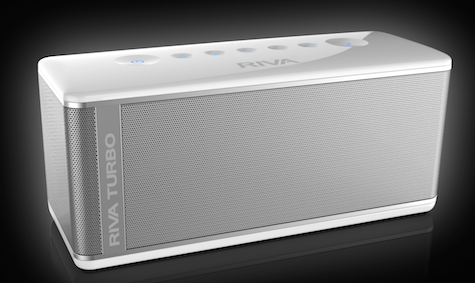 RIVA spared no expense in learning from competitors and then developing the best possible portable speaker. If Turbo X’s $350 price tag doesn’t mean you will miss a house payment or have to eat plain rice for six months, consider this premium speaker a priority purchase for all serious music lovers and small home theatre enthusiasts. rain2 In-Ear High Definition Headphones from thinksound solve three concurrent problems with most earbuds: comfort, performance, and price. 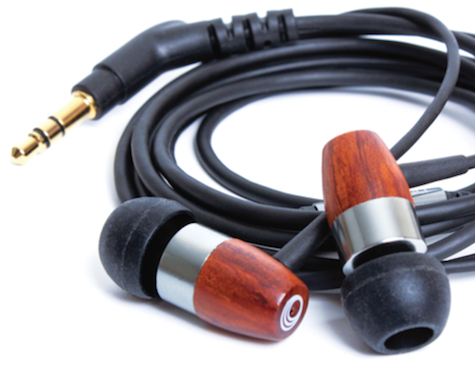 The black single blob earpiece tips are soft and comfy for extended hours of listening enjoyment. Sonic delivery is intense and immersive from rich bass through potent midrange into precise treble. The $100 cost is affordable and realistic for in-ear monitors (IEM) of this quality. Out of the package, rain2 need 20 to 40 hours of conditioning via moderate level playback, so attach them to your iDevice and put them into your sock drawer overnight for a few days. I tested these headphones hourly during the break-in period, and I could hear them ripen substantially in the process. These IEMs are exceptionally efficient, meaning they are dangerously loud at top playback levels. Be careful, please! Set your volume low for each listening session before you insert rain2 and start your device. rain2 are especially good in noisy environments, with a snug fit from the soft tips for passive sound isolation. Take them with you on an airplane journey, or when you don’t want to hear your annoying relatives argue during your next trip to visit Granny. There are no cable volume controls or phone/FaceTime/Skype speaker. The audio cables are somewhat noisy until you use them for a while. The included mesh carrying sack is lacking compared to a small Ziploc-style plastic bag. It’s impossible to know left earpiece from right in darkness. 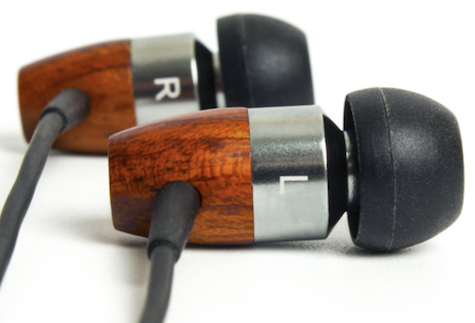 Minor complaints aside, these and all IEMs in thinksound’s catalog are recommended. Hint: A remarkable track to evaluate the above products (and others) is the song Classic by Joan as Police Woman. There is a YouTube version, and the original recording has more substantial sound. Three more good testing tracks are Blue Rondo a La Turk by Dave Brubeck and Amazing Grace by Paul Schwartz, plus Honey Don’t Leave L. A. by James Taylor. High bitrate versions are always preferred. I got the Rain2 recently – great earphone, and super deal for $99. Highly recommended.